New York Neon: Grauer Sign Co.
Shame on me for taking so long to actually patronize the great D'Aiuto bakery on 8th Avenue! I could come up with a litany of excuses, but they're all pretty lame. Anyhow, I finally made it there over the weekend for a coffee and a sfogliatella and I must say, it's my own loss for not having stopped by sooner. It's not like I didn't know about the place. 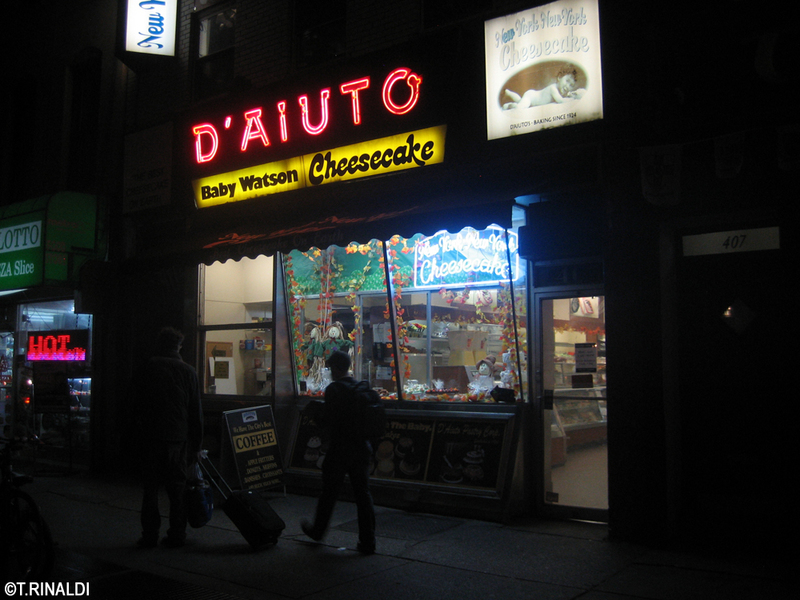 I first shot D'Aiuto's great neon sign back in October 2006. The sign is unique, and very likable. I especially like it because it's one of very few signs I was able to learn anything about from the insane number of hours I spent going through old Building Department filings looking for records on old signs and their makers. 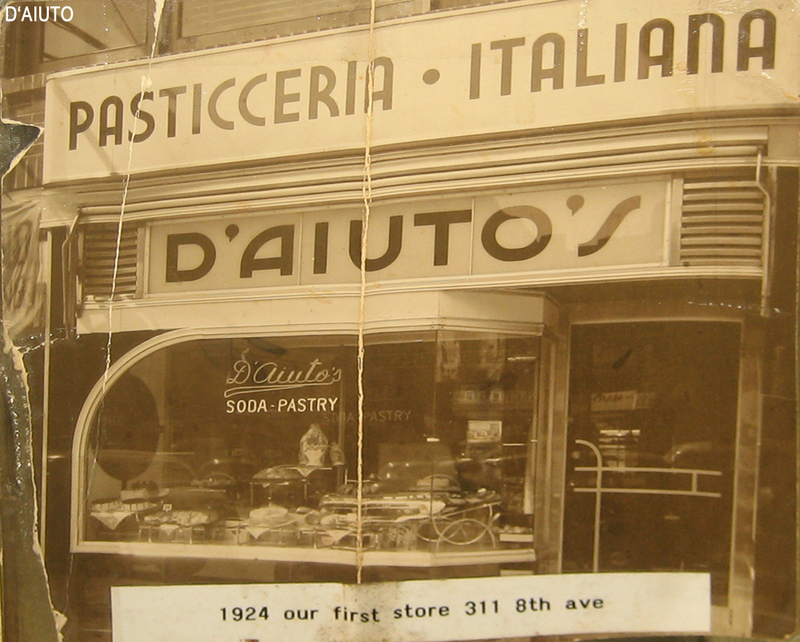 Turns out D'Aiuto's sign is the work of the Grauer Sign Co. of the Bronx. Based on the number of their old signs still kicking around, Grauer must have been one of the busiest neon shops in the city for much of the 20th century. Grauer advertised itself as "Fabricators and Manufacturers since 1928." Telephone directories list them at various addresses in the Bronx through the 1960s, then in Flushing, Queens in the 1970s. They disappear from the yellow pages by the mid-1990s. Some of their signs bear "Union Made" tags with the code number 3. Grauer seems to have been most active in the Bronx, but their signs can also be found in Manhattan and Queens (and probably Brooklyn, too). Some of the signs are fairly ordinary, but others are more elaborate, displaying a variety of midcentury letterforms and sign faces in angular, abstract shapes highly characteristic of popular advertising graphics of the 1950s and 60s. The variety of Grauer neon that survives is a good case study in the range of businesses that advertised with neon. Detractors of neon signs tend to associate the medium with unseemly enterprises, but in fact, neon signs served all kinds of businesses: surviving Grauer signs advertise everything from fuel oil to funeral homes. The sign Grauer made for D'Aiuto is one of my favorites. Installed in 1960, it is the centerpiece of a great period storefront façade that probably dates to the same year. The sign itself is trapezoidal in shape, with fluorescent pink neon tubes outlining unique letterforms that flare out at the top, like the sign. A back-lit acrylic panel runs across the lower portion of the sign, making it something of a hybrid. James and Karla Murray's great book Storefront tells us that the business has been run by the same family since it opened in 1924. Previously it had operated out of a storefront a few blocks down the street, at 311 8th Avenue. That block was cleared in the late 1950s for the construction of the Penn South houses. Like so many of New York's old neon signs, this one speaks for family-run institutions deeply rooted in the identity of the city and its neighborhoods. 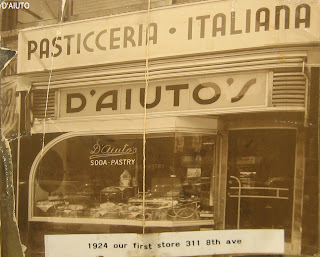 The Grauer Sign Co. is gone, but at D'Aiuto and a handful of other old businesses around the city, its work is with us still. Please drop me a line if you know anything more about the Grauer Sign Co.
• Word that the lights are back on over at the Subway Inn, after a brief scare. Excellent article. D'Aiuto is also one of my favorites. thanks.